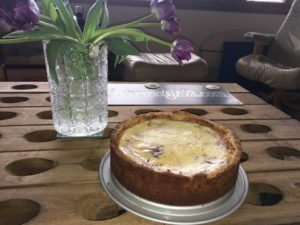 This Past Sunday,May 7th was the second week of our Sunday Baking Project. 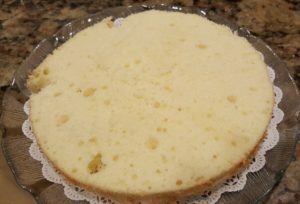 The selection this week was Lemon Chiffon Cake. It was supposed to be a nice contrast to the ‘Decadent Chocolate Cream Pie’ of last week. Indeed, it was a nice flavor contrast to the Pie but it was decadent in its own right. 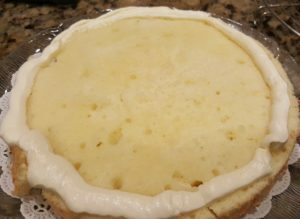 The Cake was light and flavorful and the curd between the layers was very nice and Lemony, but it wasn’t mouth puckering as lemon can sometimes be. 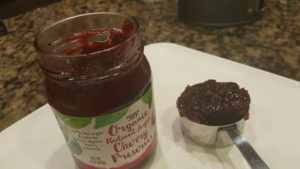 I think maybe, it could have been just a tad more tart – in other words- a little less sugar. Will try it that way sometime. 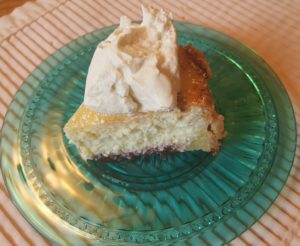 The Italian Buttercream Frosting was indeed the decadent portion of this cake as it was quite Buttery and I loved it! 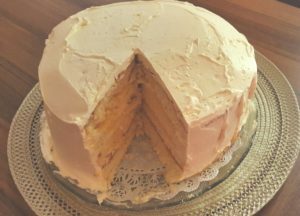 The Recipe chosen was ‘Lemon-Love Chiffon Layer Cake from the Fearless Baker Cookbook by Erin Jeanne McDowell’. 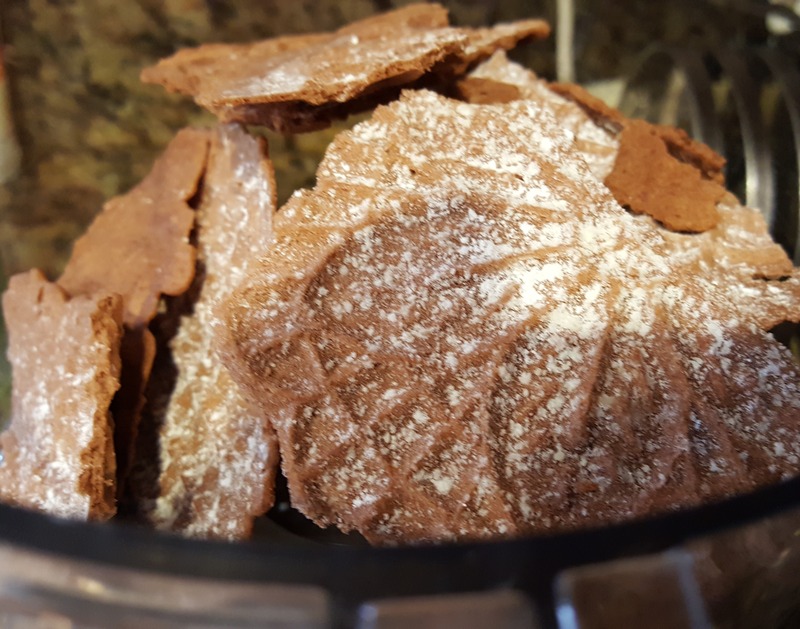 If I didn’t mention this last week, the purpose of the club is to try new recipes which none of us has ever made – not specific to the item but specific to the published recipe. 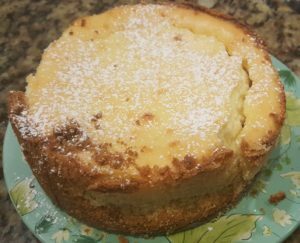 In other words, I am sure that most of us have made Lemon Cake before, but not this specific recipe. There were some things that were done differently than the traditional methods – therefore it makes it a new recipe for all of us. Before going through the procedure for making the cake please take a look at the photos which will show how the final project is interpreted through different eyes. Thank You Terrie for allowing me to use your photo for the feature image and I have to apologize to Eileen Delcore Bennet and CM Wolkon but I was unable to upload your photos. 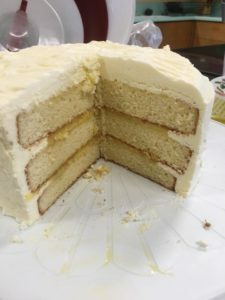 MAKING THE CAKE: This recipe actually took several steps to make and gave us the opportunity to hone different skills. 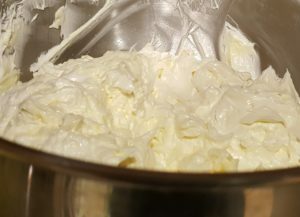 Before even beginning to prepare the Cake, Curd and Frosting, it is best to Juice and Zest all the Lemons and Lemon Product that you will need. 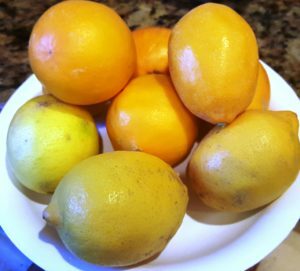 The best Lemons to use for Lemon Desserts are Meyer Lemons if they are available. 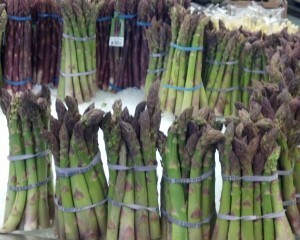 Right now in Spring, they are readily available, at least in the So. Calif. Farmer’s Markets. The difference between Meyer and Eureka is that Meyer are less tart and better for baked products. Eureka are great for cooking and for drinks like lemonade. 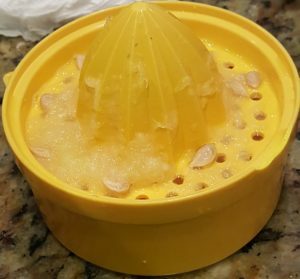 You can Zest the Lemons with a fine grater but it is best to have an actual zesting implement. 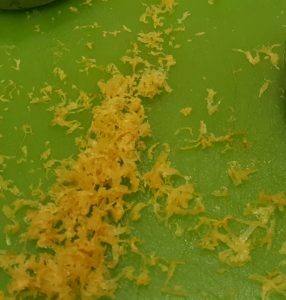 In this photo the Meyer Lemons are the ones with the orange hue and the Eureka are the ones front and more yellow. 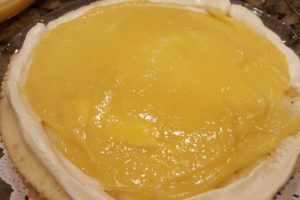 The first Preparation was for the Lemon Curd which I chose to make the day before. It needed to cool for at least 2 hours so making it a day ahead gives you plenty of time to let it chill. 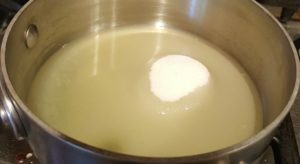 The instructions for this Curd are a little off the norm in that all the ingredients are mixed together and then cooked to the desired thickness. 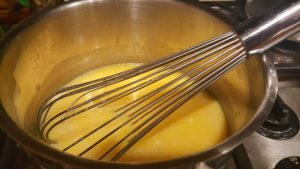 Normally, the Egg Yolks are beaten first, then tempered and then cooked to the proper thickness. Using the traditional method gives you a shorter cooking time but definitely more utensils to clean. Even though the clean-up takes a little longer I do prefer the traditional method. 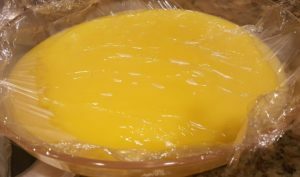 In the photo below, the Curd is covered with plastic wrap which you want to cover the curd with to prevent a crust from forming. The plastic wrap should actually be touching the curd. 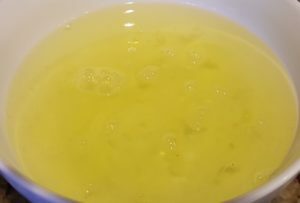 Separating the Yolks from the Whites. 4. 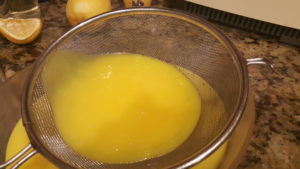 Beating the Yolks for the Cake Batter – once the Yolks were beaten to almost the desired thickness, the Liquid ingredients were added and beating resumed for one more minutes. 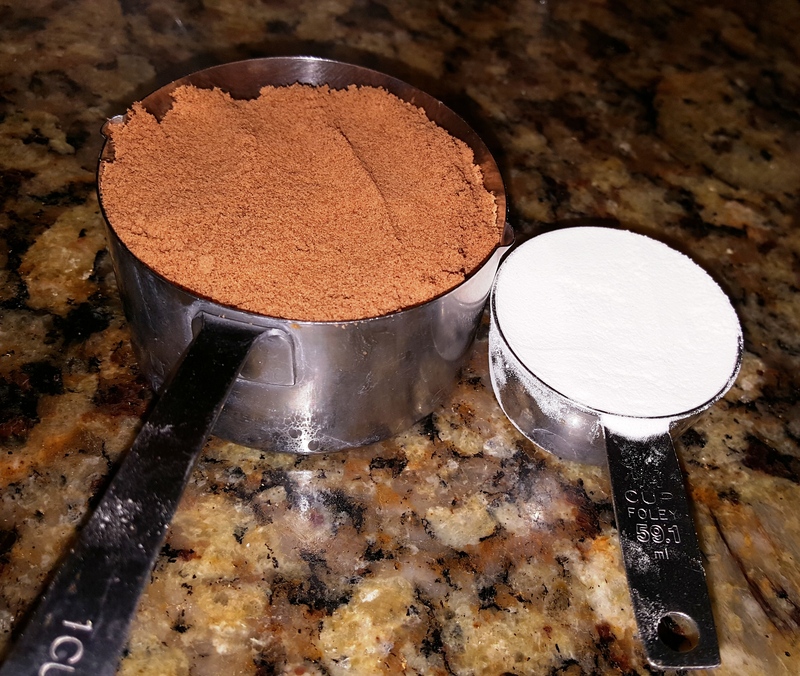 Next the Dry Ingredients were added in four separate increments. 5. 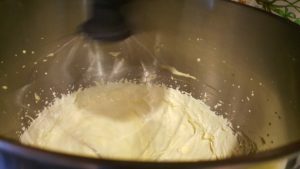 Beating the Whites to add to the almost finished Batter. 6. 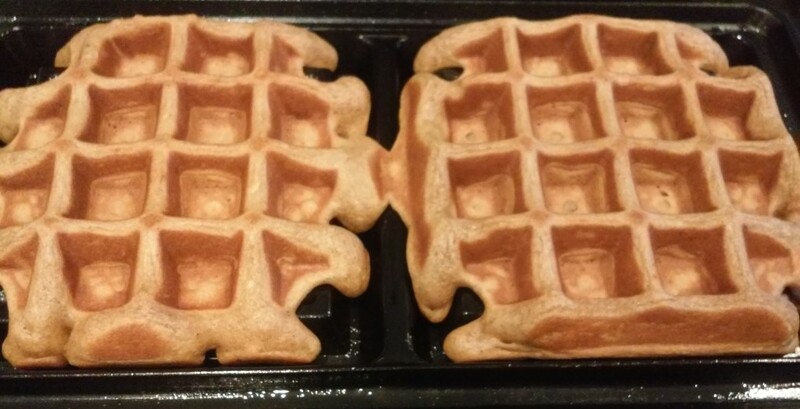 Next the Whites were folded into the Batter and then the Batter was divided between two greased and floured Pans. 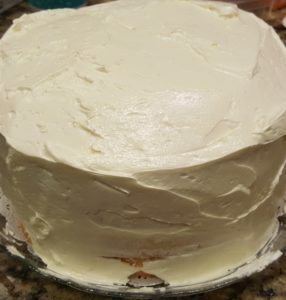 I recommend lining the greased pans with parchment paper to allow for easier cake removal. 7. 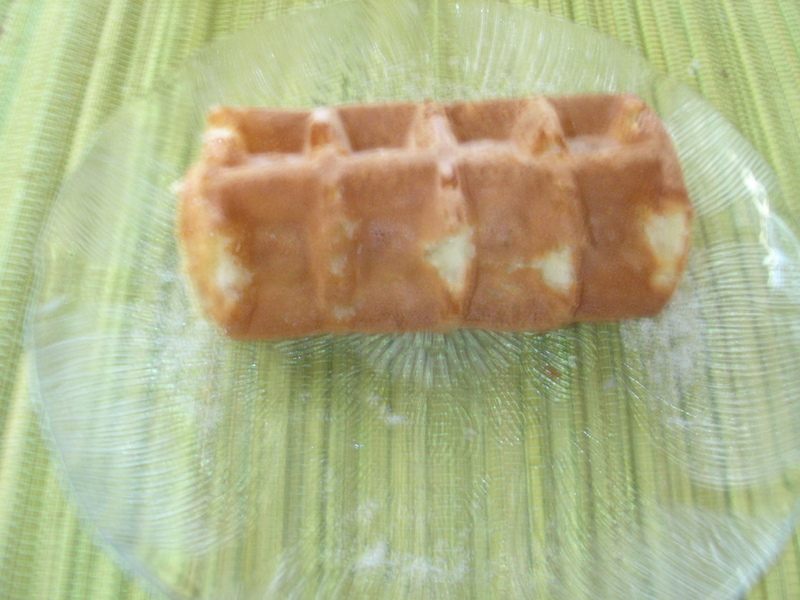 The Cakes were baked and cooled and then brushed with the Lemon Syrup. 8. Making the Lemon Syrup involved only combining the Lemon Juice with the Sugar and bringing to a boil so that the Sugar is completely dissolved. This takes only minutes. 9. 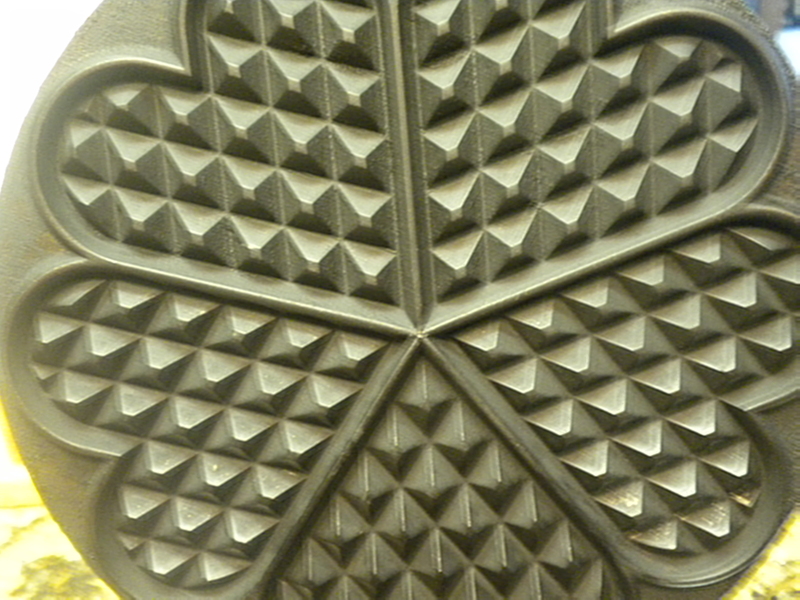 Once split in half there are 4 separate layers. Each one should be brushed with the Lemon Syrup before assembly. So All in All, there were a lot of skills involved. 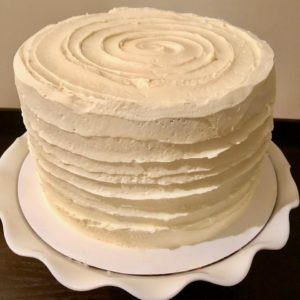 Of course it is easier for an accomplished baker to do these things but it is also a good recipe for a novice to learn these skills. All in all, the Cake was delicious in every part of it. 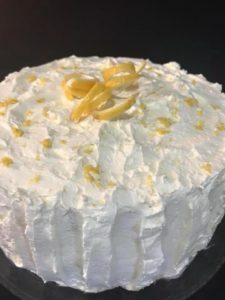 I do love Lemon and especially Lemon Curd but do also love the Italian Meringue that covered the cake. 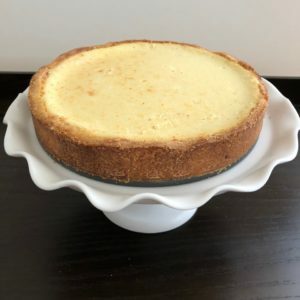 A Group of Culinary Friends and myself (sparked by a suggestion from Terrie Cooper and Eileen DelCore Bennet (who created the Sunday Baking Project Page) have formed a group, the object of which is to try out new recipes. 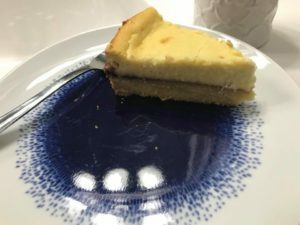 This week, the first one, the recipe was chosen by Terrie. We all made a Chocolate Cream Pie from the book ‘Flour’ by Joann Chang. 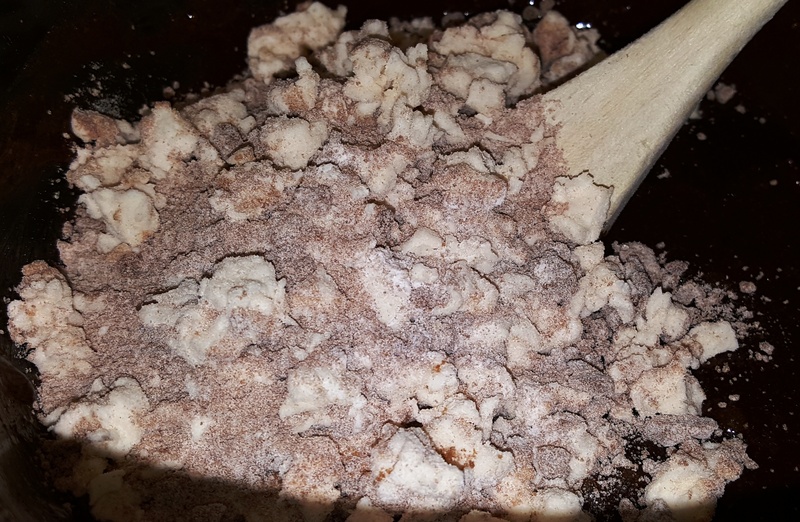 We were supposed to make the recipe exactly as called for in the recipe but knowing this dessert was going to be dessert at a Luncheon I had for my Grandson and Wife and Nephew and Fiance, I didn’t want to take any chances in it failing and having to do it over or making something else. 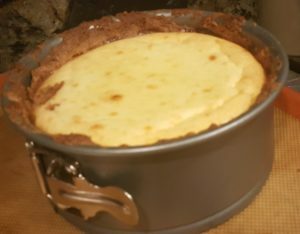 The only deviation I did was to bake the Crust with Foil and Pie Weights for the first half of the baking period and it is a good thing I did because some of the other people in the Group had shrinkage of their crusts. I also put Raspberries on top instead of shaved Chocolate because I didn’t have any Milk Chocolate and Dark Chocolate would have been too bitter. 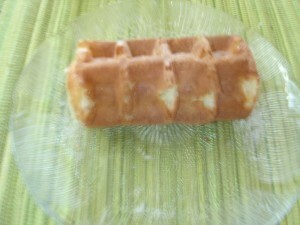 Next week I will do the recipe exactly as called for. 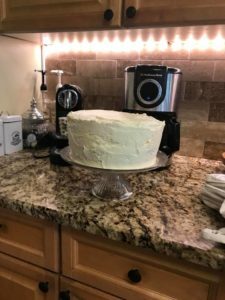 The Group is called the’Sunday Baking Project’ but since we each make the product in our own kitchens we don’t necessarily have to make it on Sunday but we do post it on Sunday. 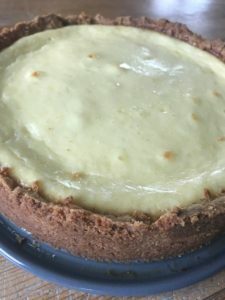 It is fun to do and we all end up with a great baked product and get input from each other as to what we like or don’t like about the recipe and ways to change it if we want. 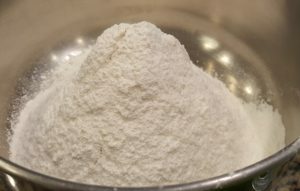 Make the Crust – Pate Sucre with: 1-cups All-Purpose Flour, 1/2 tsp. 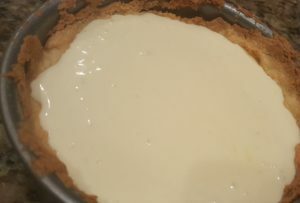 Salt, ¼ cup Sugar, 1/2 cup soft Butter and 1 Egg Yolk.This Crust made in a Standing Mixer with the Paddle Beater and is actually a Cookie Dough and therefore is made like cookies with the Butter and Sugar being creamed together before the Flour, Salt and Egg Yolk are added. It is a very rich Dough and needs to be chilled before rolling out. Once you do start rolling, it does warm up very quickly so the rolling out process needs to be quick. After the Dough is fitted into a 9 or 10″ Pie Pan, it is then chilled again for at least 30 minutes before baking. I baked it with foil and pie weights even though the directions did not say to do that. 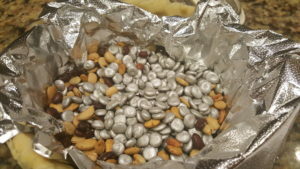 Some of the participants who followed the recipe exactly had shrinkage so I think using the foil and weights is a good idea. 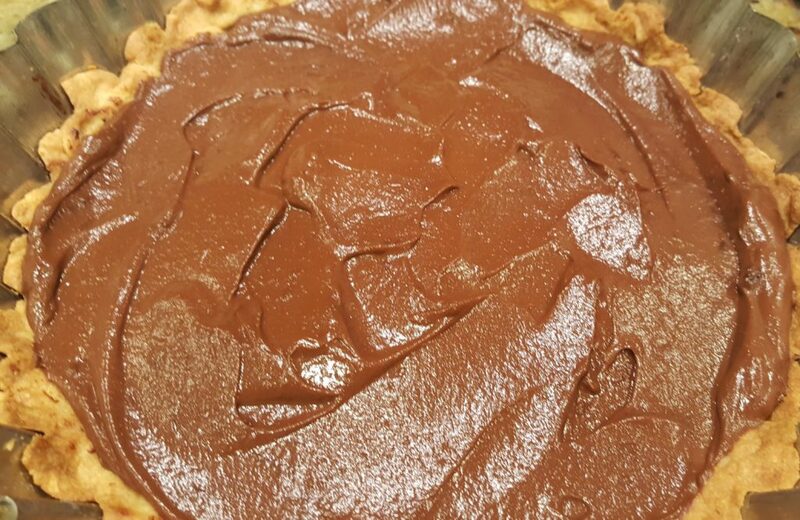 After the Pie Shell is baked, some of the dark Chocolate is placed on the crust and then returned to the oven for the chocolate to melt. 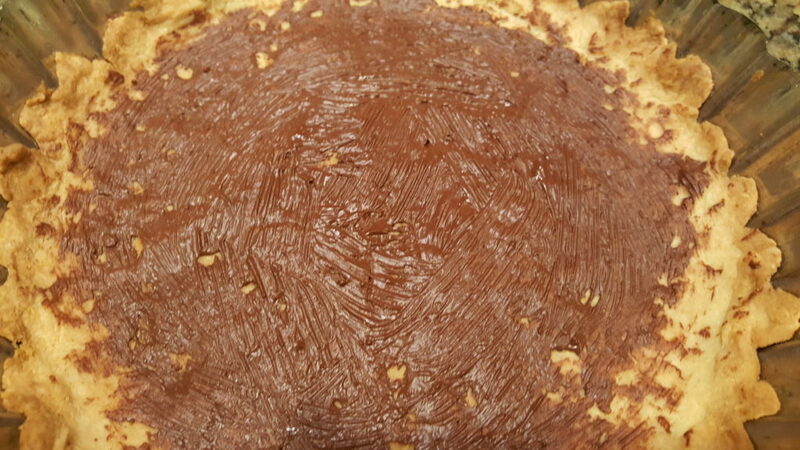 Once the chocolate is melted then you spread over the pie crust. 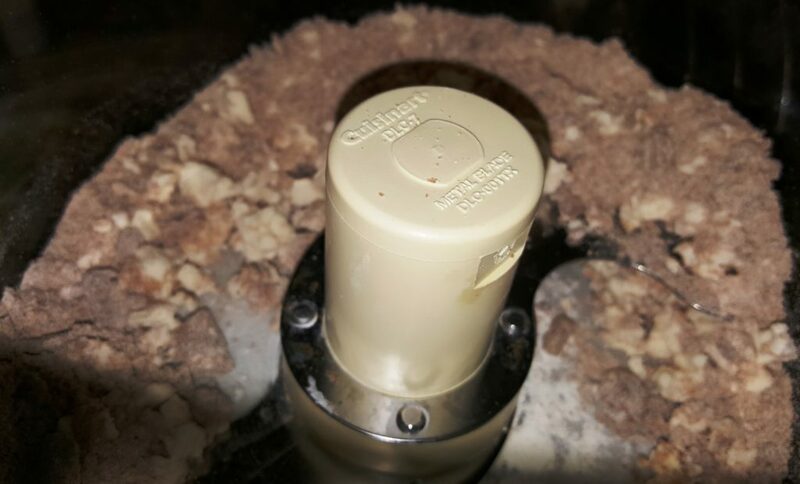 This seals the crust from the filling and prevents it from getting soggy. 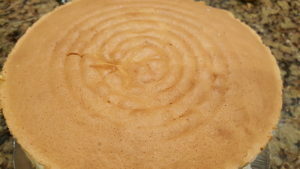 I used a Silicon Pastry Brush to spread but a small spatula can also be used. 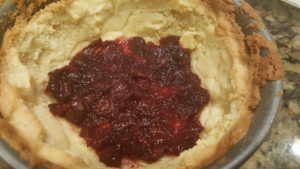 Once the filling is made it is put though a strainer and then poured directly into the baked and sealed crust. Refrigeration for 8 hours before serving is called for. The Pie is topped with Whipped Cream and shaved Chocolate. The complete recipe and directions can be found in the book for whoever is interested in purchasing it. The Summer Heat Waves are over, Daylight Savings Time has ended and finally, it feels like Fall. Time to switch meals from Summer Light to Fall Hearty. This morning for Breakfast we had freshly baked Pumpkin Muffins along with Scrambled Eggs and fresh Coffee from Thunder Mountain Coffee on the top of Hawaii near Kona. Having recently visited there it was hard to resist bringing back some of their Coffee. Normally I am not a big Coffee Drinker and can do without but Thunder Mounter Coffee is excellent and I guess I am going to have to purchase some using mail order. 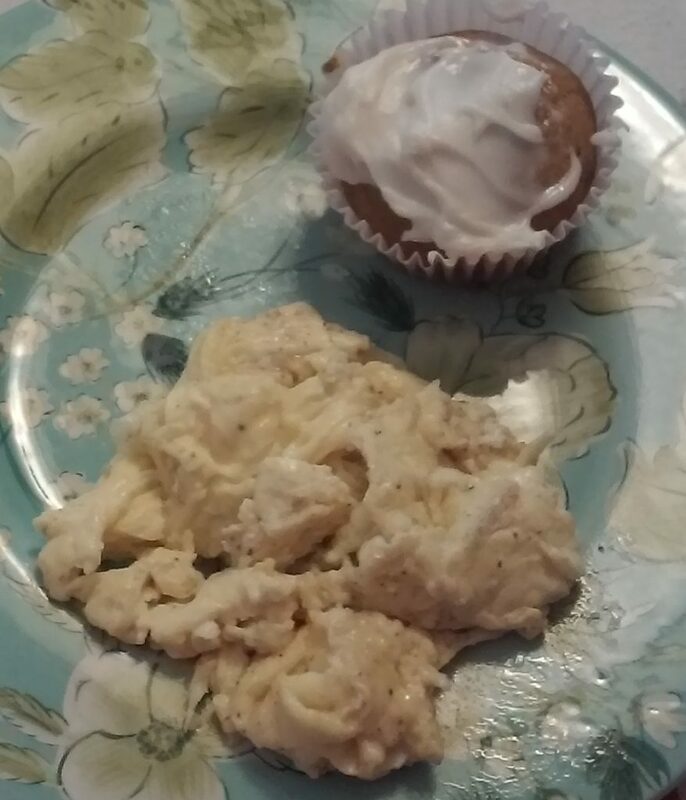 Pumpkin Muffins with Cream Cheese Frosting and Scrambled Eggs. 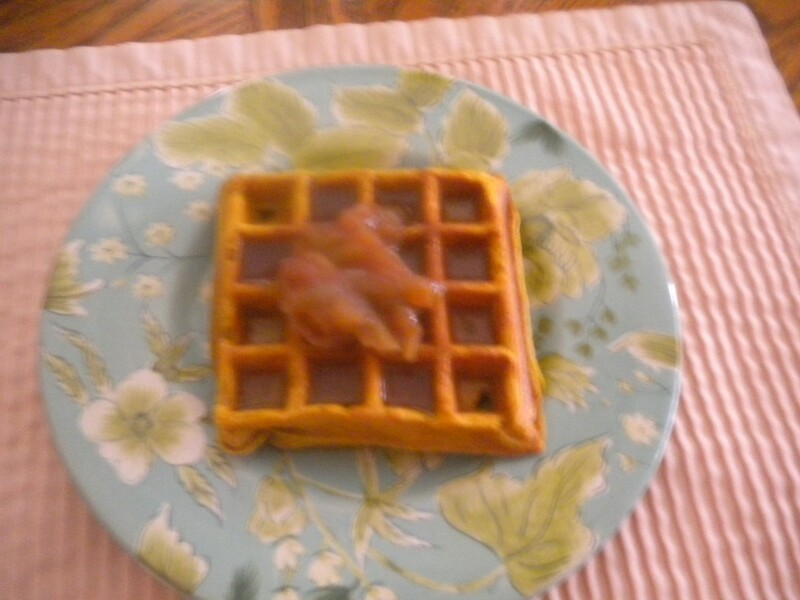 To get back to Fall Foods, please check out some of the recipes on my blog. You will find them simple to prepare, delicious and warming to eat. Fall is time when Squash is plentiful, freshly harvested, and delicious when prepared properly. Let’s start with Butternut Squash, a favorite among Italian Chefs. Here is a recipe for . Try it and let me know what you think. 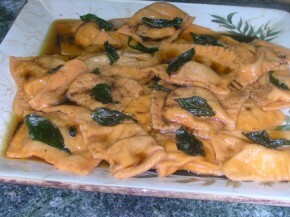 While we are talking about Pasta and Squash (and yes, Pumpkin is a Squash) think about making Ravioli de Zucca. A delicious variation of Ravioli and not too difficult to make. 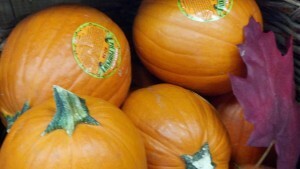 It is early Fall and the Pie Pumpkins are in the market waiting to be purchased. Golden Squash Jubilee is another delicious recipe – you could almost any kind of squash but yellow or orange is most attractive. Sweet Potatoes or Carrots can be substituted for the squash. This dish goes well with Poultry (Thanksgiving Turkey? ), Pork or even Fish. Squash can even be used to bake with. 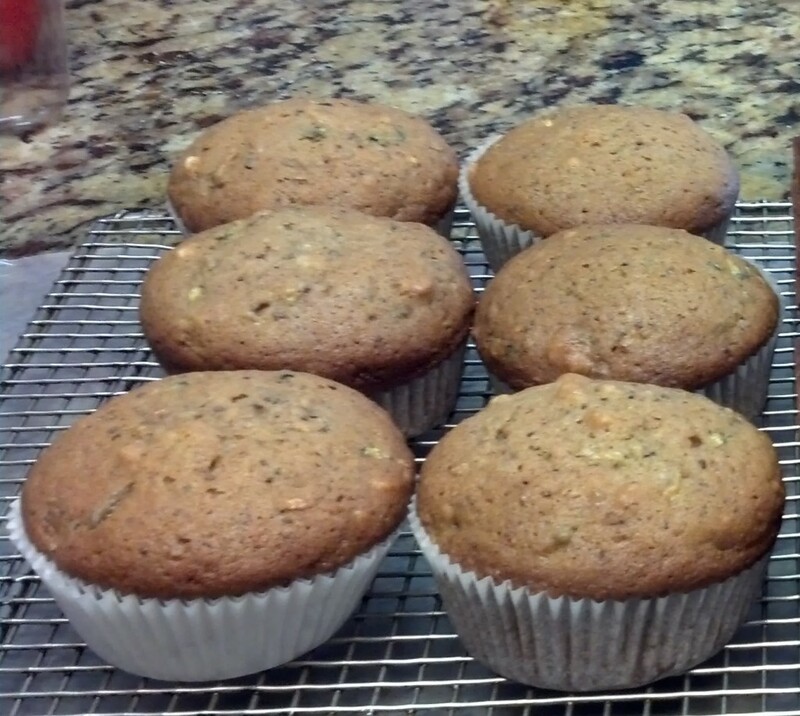 Zuchinni Muffins are delicious – a good way to get vegetables into your diet. 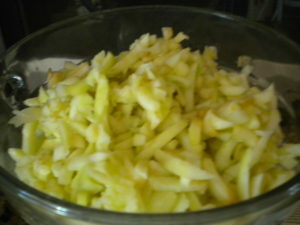 For variation you can substitute Apples, Pumpkin or any other kind of fruit for the Zuchinni. 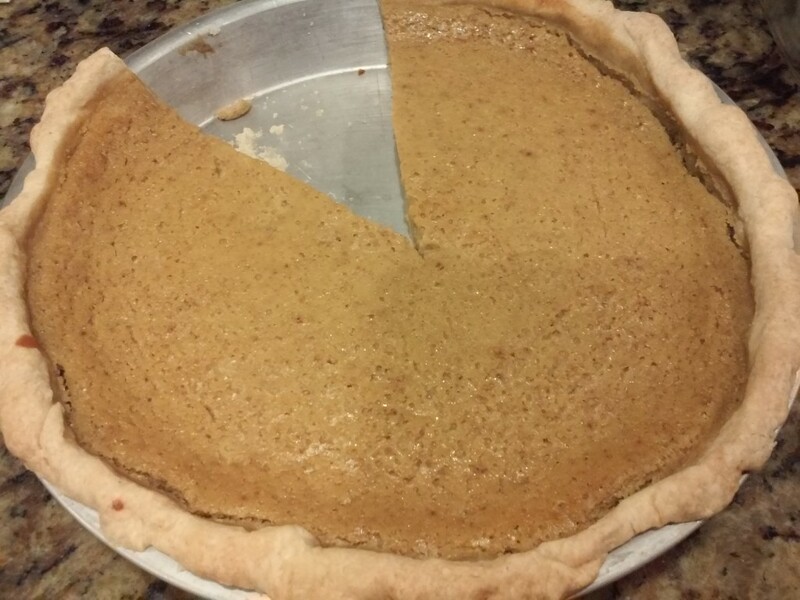 While we are talking about Fall Foods and Pumpkin specifically don’t forget about that Pumpkin Pie. 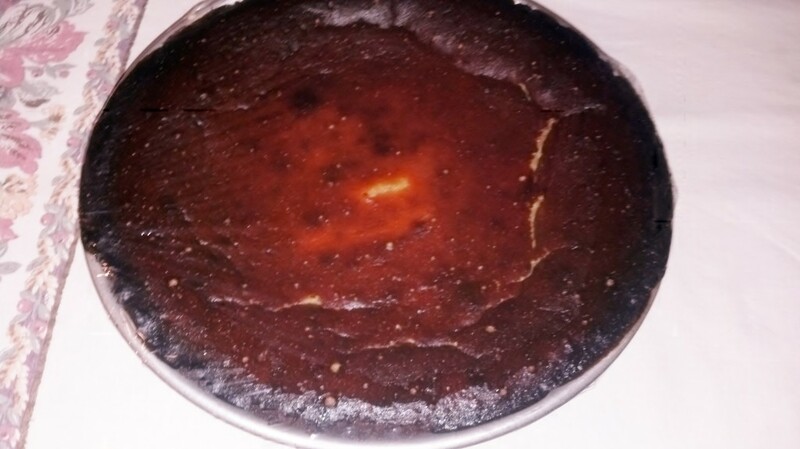 Follow the link to a delicious Pumpkin Pie Recipe in a non-traditional Pecan Crust. 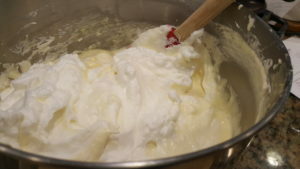 Serve for Thanksgiving Dessert with freshly Whipped Cream. Even though the Pie below may look burned it is not. 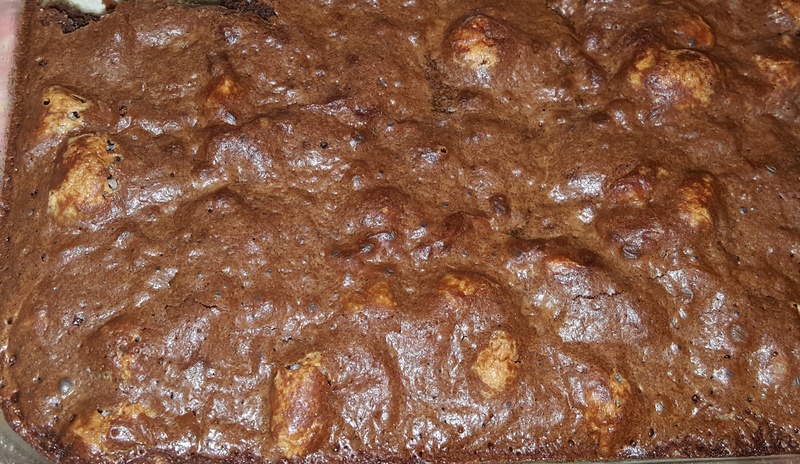 It is just nicely and well browned. Comfort Food is Food that warms the body and the soul. It makes you feel good and satisfied after eating it. 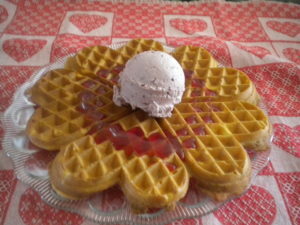 I think Comfort Food is different for different cultures and different people but there are variations within the dishes that we call ‘Comfort Food’. 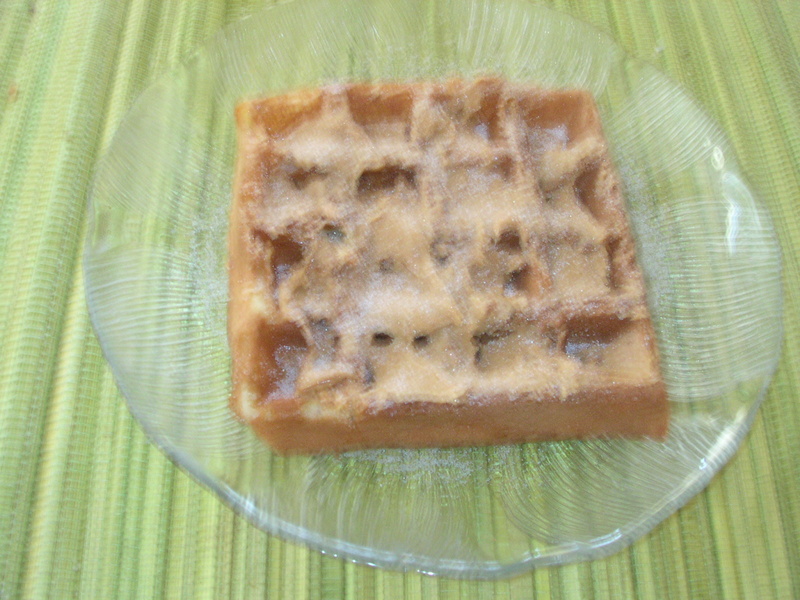 The differences are not so much in the main ingredients but in the preparation techniques and the seasonings used. Here is another great Comfort Food that really warms you inside – Vegetable Soup – it can be served as a complete meal with the addition of some protein and delicious fresh bread. It can also be served as a first course and the leftovers are great for lunch. 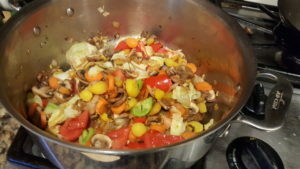 I love to make Vegetable and it is one of my favorite ways of cleaning out the Vegetable in my refrigerator. If you have ever wondered what you are going to do with all those vegetables that you just can’t seem to getting around to use or even if like I do, you have little bits and little bits of that, Vegetable Soup is the perfect vehicle for using up those items. So when I taught school, I taught my students how to make ‘Clean Out the Refrigerator’ Vegetable Soup. What you will need is a large pot and some Olive Oil and whatever you can forage from your refrigerator. If you don’t have items in your refrigerator that you can use, you can always visit your local Farmer’s Market or Grocery Store to pick up whatever you wish to put in your soup. For the last batch I made, I used Onions, (a must), Celery, Carrots, Mushrooms, Tomatoes and Tomato Paste, Frozen Peas and Corn. For the batch before this one I used a Sweet Potato and Spinach. Visit vegetable-soup for the complete recipe. Saute your Vegetables (starting with the Onion and Mushrooms) in Olive Oil. I always salt the Mushrooms as they do need and it helps to leech out some of the water in their pores. Once they have cooked and started caramelizing add the remaining fresh Vegetables and dried herbs. For the liquid I use either de-fatted Turkey, Chicken or Beef Broth, depending on what is in my freezer. Vegetable Soup does not need to cook for a long time – you do not want really mush vegetables. It is much better to have some texture left to bite into. 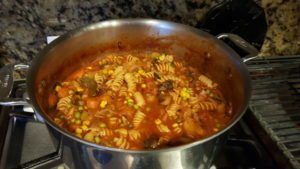 About 10 minutes before serving bring the soup up to boiling and add about 1 cup uncooked Pasta. Once the Pasta is ‘al dente’ add fresh Herbs (in this case two kinds of Basil), and frozen Peas and/or Corn if you are going to use them. A couple of minutes is all you need for these frozen Vegetables. To make a complete meal out of your Vegetable Soup, add some Protein such as Tofu (for Vegans), Chicken, Sliced Hot Dogs or Sausage or Turkey. Any one of the above make a great addition to your soup which is also delicious without it. Just serve it with some Hot Fresh Bread. The City of Fillmore, CA is known as the ‘Last, Best Small Town’. Small it is, as it only incorporates an area of 3.4 square miles. But small as it is, it is still an incorporated city since 1914. The city gets its name from J. A. Fillmore who was a general superintendent for the Southern Pacific Railroad which came to the Santa Clara River Valley in 1887. Fillmore is located 39 minutes north of Thousand Oaks traveling on the 23 North. The 23 North ends at Moorpark, so you have to exit the Freeway and travel down Los Angeles Avenue to get to the roads taking you to the 23 North. (It is well signed, so you can’t miss it) (Google also gives you correct directions) It is a mountainous route with lots of turns (and this time lots of road work being done) One of the nice things about this drive is that you get to view the Orchards and farms that you thought had disappeared from the area. (Fortunately, only the obvious ones facing the Freeway have been the culprit of more and more condos and homes.) So the Santa Clara River Valley of which Fillmore is a part, still is well endowed with agriculture, fortunately. As you enter the city limits the sign proclaims that the population is 14,000 and the elevation is 469 ft. The sign looked a little worn, so I am making an educated guess that the population is larger than 14,000. 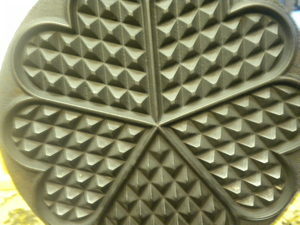 (According to the 2012 Census, the Popoulation was 15,002. The reason for this is that there are a lot of new home developments and people from outlying areas are probably taking advantage of this (home prices have got to be lower than the Conejo Valley or other nearby areas – it takes a little drive to get to Fillmore but it is a nice place to live and raise a family. The School District consists of two High Schools, one Middle School and four elementary schools. Returning home, I decided to take the 126 to Ventura to avoid the road work and the twists and turns. It was quite a few miles longer but didn’t take any longer as you could go faster than 35 miles per hour and there were no twists and turns. So much for particulars – Fillmore used to be a quaint little town that was fun to visit. On my recent visit there it looked entirely different than I remembered it from past visits. Fast Food and Big Block stores have invaded there as they have in almost every sector of this country. ‘Not so Good’. But if you go to the back streets and the area where the City Hall is located you will find remnants of the past. I went up one such street and found the water Tower with the name of the city well visible. I also found the rail tracks and loading docks for the freight trains that bring merchandise to the town and/or take it from the town. 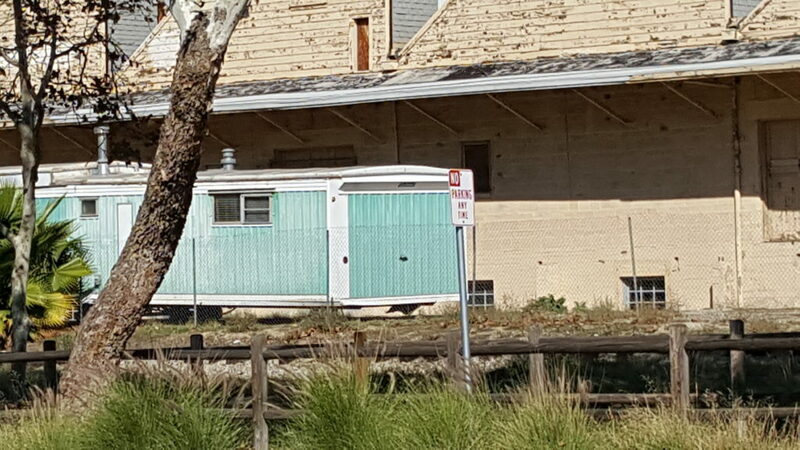 The Train System is a big part of Fillmore – in addition to the freight trains bringing merchandise in and out of the town, there are also tourist trains which run to the orchards. There are event trains such as the ‘Mystery Dinner Train’ which I have been on. There are also other events such as the ‘Pumpkinliner’, ‘Christmas Tree Train’, ‘North Pole Train’, etc. The train system is Fillmore is also the scene for many movies and tv shows. 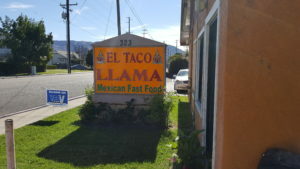 This last time that I was there it was lunchtime and I decided to try what looked like and was an authentic Mexican Restaurant, called El Taco Llama. The menu had a lot of variety – there were many, many items you could choose from and everything was made to order. My lunch was the two taco plate which came with rice and beans and salad and Guacamole. There were plenty of salsas on the side from the salsa buffet, both mild and spicy. 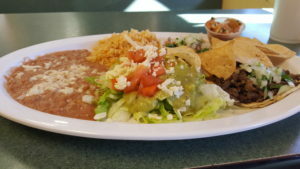 Even though the tacos were the small authentic style, I could not finish the whole plate as the sides were plentiful. For something to do and someplace to go that is different try taking a trip out here – park your car and walk around but stay away from the chain stores. These are not Fillmore, but everywhere USA. i love growing Tomatoes and contrary to the rule of thumb that you only need one plant per person in the household, I like to have many more. First of all, I like variety and second of all, not all plants will produce as they should. This year I planted 6 Tomato Plants and have two left over from last year. Unfortunately, the ones from last year are not producing too well. Probably because they are not in full sun – we only have so much garden space that will get sun. Even though my larger Beefsteak type Tomatoes produce more and larger fruit, my favorites this year are the Green Zebra and the Lucky Tiger. I don’t think my Lucky Tigers are growing to the size that they should but they are fun – they are shaped like the Romas, but thinner and are green with orange/red stripes that are supposed to be dark purple according to the tag that was on the plant when I bought it. In spite of that, I still love the tomatoes. They are fun to grow and delicious to eat. 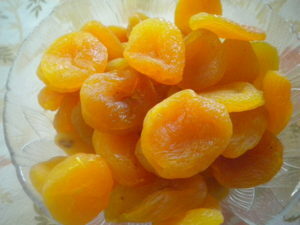 They have a slightly tangy taste to them in contrast to the red tomatoes which are very sweet. All this being said, what do you do with Tomatoes when you have an abundance of them? You can only make some many salads and eat so much salsa. In past years I have made Chili Sauce and will probably do that again this year if the plants keep producing like they have. For this batch though, I decided to make a Tomato Basil Soup. 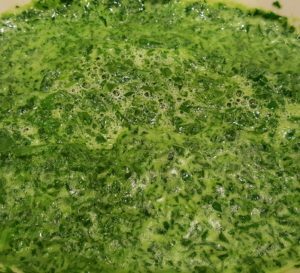 This is a tasty soup that can be eaten hot, warm or cold so it is perfect for summer or any time of year. 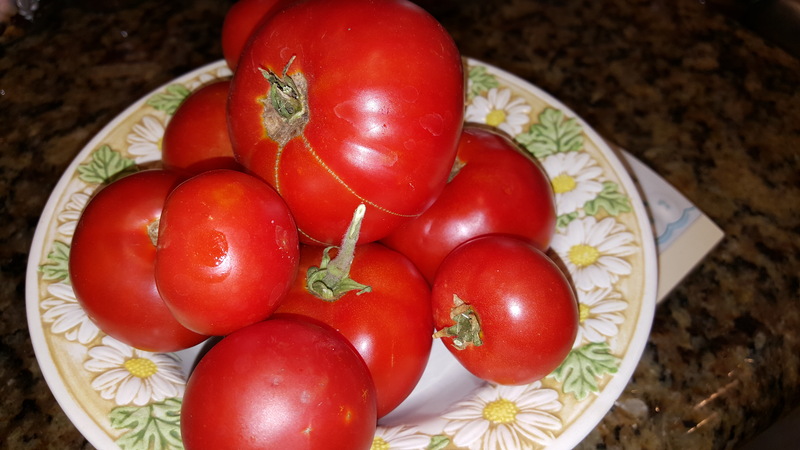 The recipe actually calls for Roma Tomatoes, but not having Roma Tomatoes, I just used what I have growing and that is mostly red round tomatoes. Even though I put the tags that came with the plants in front of the plants, they somehow get lost or covered up so except for a couple of the plants, I’m not really sure what kind they are. Just round, red, sweet and delicious! The Soup can be served as a first course or as a Vegetable Dish along with a meal – that is what I did last night. We had Meat Loaf, Baked Potatoes and the Tomato Basil Soup which I actually served first, but we had seconds along with the meal. I serve this soup in small bowls but it can be served in larger ones. Another way I like to serve it is in demitasse as a ‘stand-up appetizer’ for company meals. The recipe calls for 2 lbs. of Tomatoes, 1/2 cup of diced Onion, Chicken Stock (I had Beet Water leftover from cooking Beets so I used that instead thereby making the soup good for the Vegan or Vegetarian Crowd. 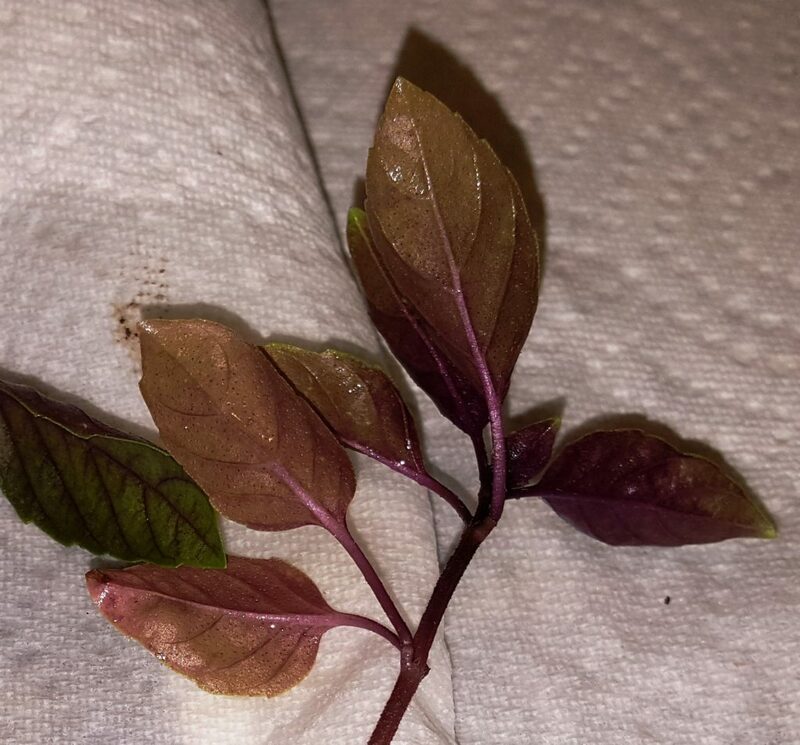 Of course you also need Basil which I also have growing in the yard. 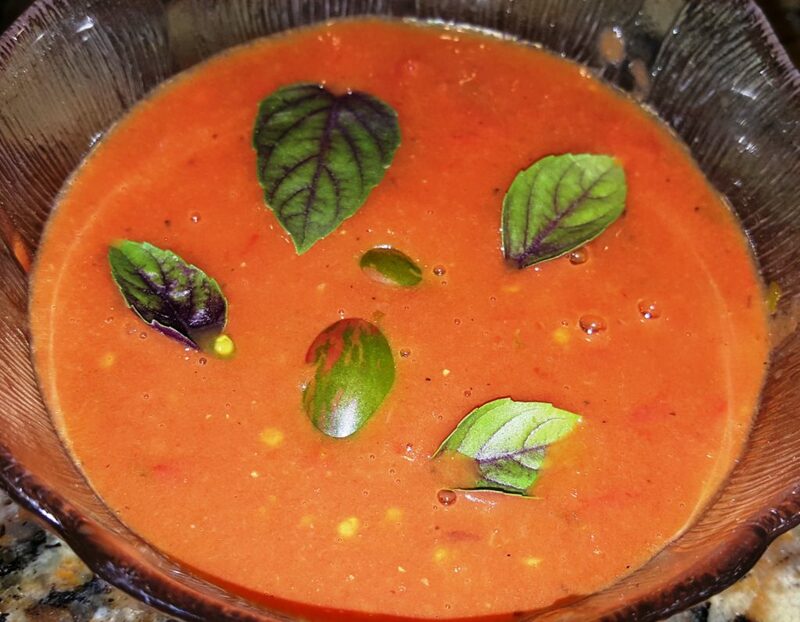 I used the Italian Sweet Basil for the Soup and Purple Basil for the Garnish along with the Lucky Tiger Tomatoes. 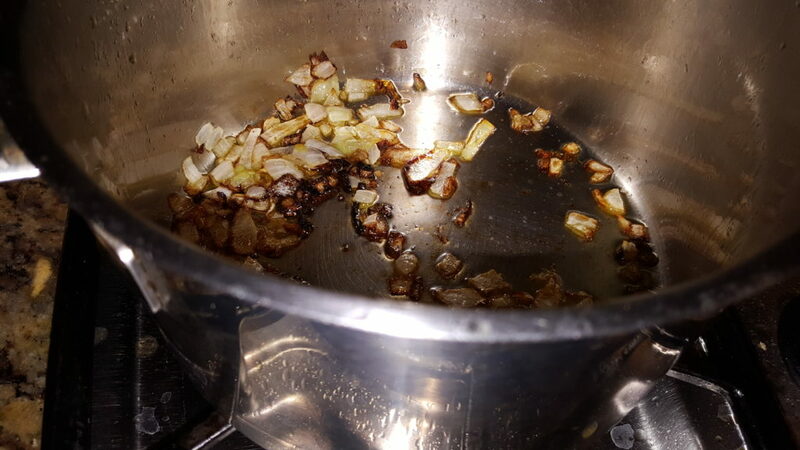 Saute the diced Onions in 2 Tbsps. 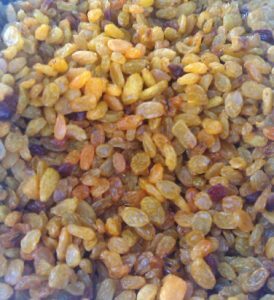 of Olive Oil until they are soft – from the photo below, you will notice that mine are slightly caramelized. This add additional flavor as long as you don’t let them burn. If they do burn, discard and start over – the burn taste will ruin the soup. 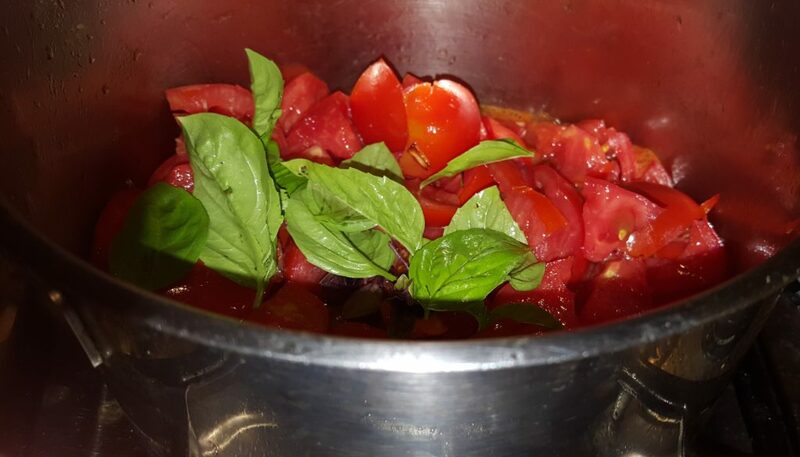 Once the Onions are sufficiently cooked, add the prepared Tomatoes and Basil and cook until the Tomatoes release their water. Mix as they cook. When the tomatoes are sufficiently cooked, transfer to a food processor fitted with the metal blade. 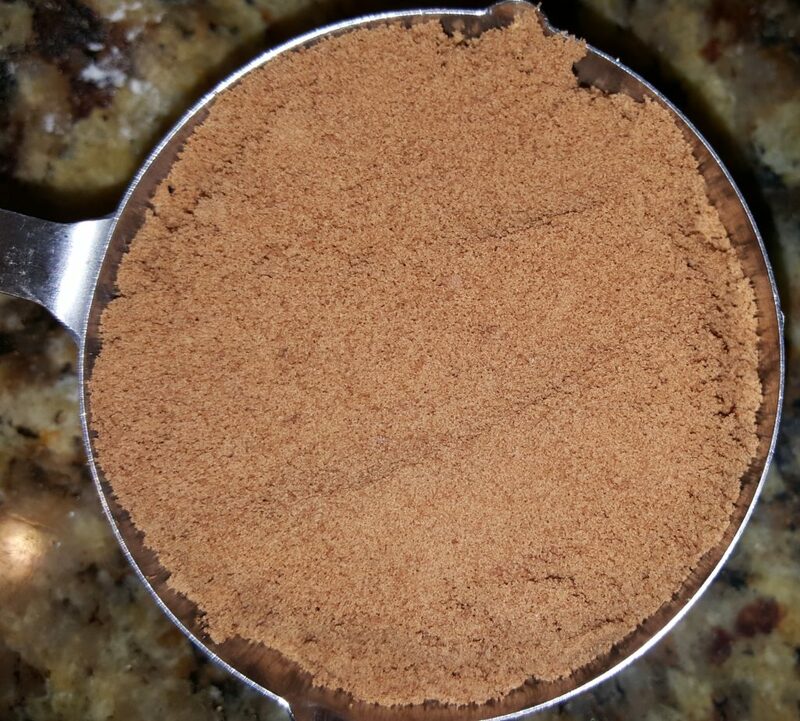 If you don’t have a food processor, use a blender or a food mill. 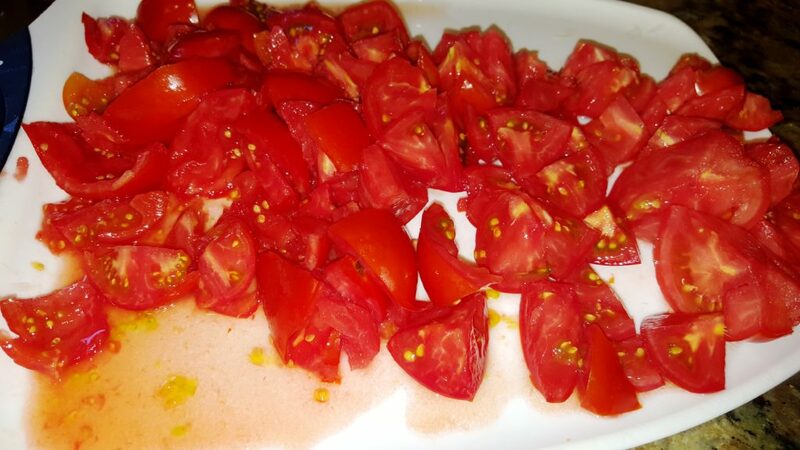 Run the processor or blender until the Tomatoes are completely pureed and then return to the pot. 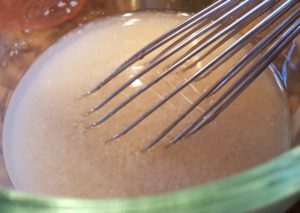 Add the remaining seasonings -taste and add additional salt or Vinegar, if so desired. Serve Hot with tiny Meatballs or at Room Temperature or Cold as an Appetizer. Garnish with additional Basil and diced Tomatoes, if desired. I used the Purple Basil and Lucky Tiger Tomatoes which only need to be sliced vertically down the middle. For additional zest add a splash of your favorite style ‘Old Boney Mountain Hot Sauce’.